Want to know whether you have what it takes to lead others? Excellent leaders bring out the best in the people around them. It takes a certain natural tendency combined with learned skills to be a good leader. While some people are certainly not cut out to head up a group, others just need a boost from some leadership training courses. A leadership test is a great and efficient way to find out whether you possess the personality traits and skills that characterize good leaders. To customize this template after signing up, choose ‘Leadership Test’ as example when creating a new survey. 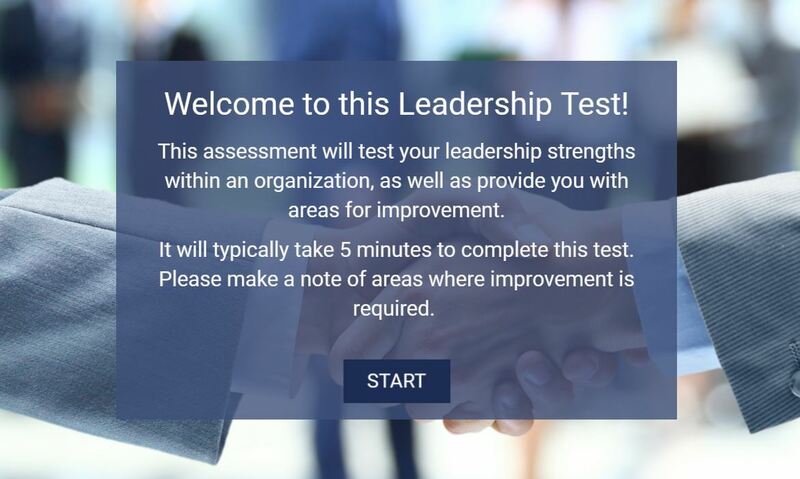 What is a leadership test? A leadership questionnaire aims to assess and evaluate specific personality characteristics that have been linked to leadership traits. Using this feedback, you can identify their strengths and aim towards improving areas that may currently require further development. This information is also used for selection and assessment purposes. For example, it could provide insight into whether an employee would be suited to take on a more managerial role or ensure that the most capable individual is selected for a leadership role. Why use Survey Anyplace for leadership tests? Send personalized reports via PDF or email based on the responses of each individual. Your brand as the centerpiece of your questionnaires. Automatic Color Selection, responsive design and loads of templates will make you a gorgeous survey in a matter of seconds. Remove every mention of Survey Anyplace with our White Label option. Let people take the quiz on-, offline and on any device they want. With our responsive design, you’ll have the best experience on every screen. To use this sample sign up for Survey Anyplace , and choose ‘satisfaction survey’ as template when creating a new survey.